Do you tend to lull yourself to sleep with your smartphone in hand? Do you like to check your messages right as you greet the day, before even getting out of bed? If so, you’re not alone. 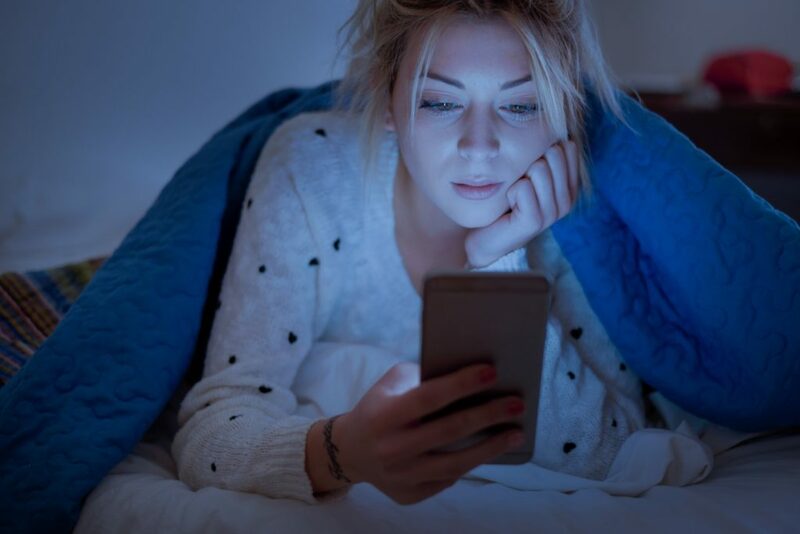 Some surveys have shown that up to 95 percent of adults use electronics within an hour of trying to fall asleep, and nearly 80 percent grab their phones and start scrolling again within 15 minutes of waking. But before you get too comfortable thinking of your smartphone as an extension of your arm, you should know that all that screen time could be seriously damaging your sleep. Here at our store, we’re all about getting you the best sleep possible, but even our best Sealy Posturepedic mattresses can’t do you much good if you’re glued to your phone all night! Tech can do a lot of damage to your nightly sleep, and keeping the two as far apart as possible can help you avoid a major case of screen-somnia. In today’s fast-paced world, slowing down and setting aside the constant stimulation you get from smartphones and computers can seem like an impossible task. Checking emails, keeping up to date on the news, and scrolling through pictures of friends feels like an all-hours responsibility for lots of people, but the benefits of setting that aside around bedtime are worth the initial separation anxiety. The problem comes down to the type of light your screens all emit. Blue light comes from every screen you use, from your flat screen TV down to your smartphone, and it’s been known to inhibit the production of melatonin, the hormone that helps you sleep. Enough screen time before bed, and you’ll be wide awake long after you put your devices away, wondering what went wrong. This blue light can also lead to interrupted sleep. That means that even if you’ve invested in the right Sealy Posturepedic mattress, the right bed frame, the right everything you need for the perfect night of sleep, too much screen time will have you waking up groggy every morning. Letting technology invade bedtime can also have a major psychological impact. That feeling of having to be on top of work and communication all the time creates an ever-present tension that’s hard to shake, even after you set your devices aside. You might start to stay up late stressing about all the things you should be doing online or worrying about missing a phone call or important email. All that stress keeps you from enjoying time with your partner in the evening and truly unwinding at the end of your day. So start breaking those bad habits, and learn to let go of round-the-clock mental stimulation — trust us, your brain will thank you. The first thing you should do is keep large screens far, far away from your bedroom. Televisions, tablets, and laptops should find a home in the living room or office, where you can’t be tempted to keep working from bed or to fall asleep with your favourite shows running in the background. Cell phones are a little trickier — many people use their cell phones as an alarm clock or like to have them nearby in case there’s an emergency at work. But unless you’re literally an emergency responder, chances are that most work crises can wait until the morning. Your time at home should be yours, and you won’t be able to work at full capacity while you’re at the job if you haven’t had time to decompress at home. If you can, swap out your cell phone for an old-school alarm clock without any lights and leave your cell phone plugged in across the room, or in the living room if possible. That way you can resist the temptation to start working as soon as you open your eyes, and you’ll start your day off with unnecessary stress. If you really can’t avoid keeping your cell phone near your bed, be firm about setting it aside in a drawer, or with the screen turned completely off. An eye mask is another great way to block out any ambient light from cell phones or other electronics you keep in your room. But if you can, we recommend making your bedroom, or at least the bed itself, a totally tech-free zone. If you’ve been tossing and turning, try taking the screen-free bedtime challenge! You won’t believe the difference you’ll feel after a full, restful, smartphone-free sleep. But if you’re still not feeling as rested as you could be, the problem might run deeper than blue light — it might be deep in your mattress itself! Your sleep is important to us, so if this sounds like you, we’re here to help! Stop by and ask our associates how a new Sealy Posturepedic mattress can improve your sleep or give us a call for even more info on how to get the best out of your nightly rest.